There are numerous reasons why an organisation will consider an office move, a lease break or expiry may be looming or they may be growing as a business and need to find a larger, more fit for purpose space. The office has evolved to a point where it is now viewed as an asset that can be instrumental in attracting and retaining the very best talent, the lifeblood of an organisation and as a result, more and more companies are investing in creating workplaces that staff want to work in. The “Great staff deserve great offices and great offices deserve great staff” ethos has gained traction and many companies are now creating new workplaces, designed with staff in mind. When you are tasked with an office move project, it can be daunting especially if it is your first time undertaking something like this. We hope this short guide provides logical step by step instructions to follow and proves useful – you can read the guide below or click on the download as a PDF button located on the top right of the page. So, you’ve been asked to investigate potentially relocating your existing office, where do you start? One of the questions regularly posed at this stage is ‘Should I stay or should I go?’, so creating a list of pros and cons is a good starting point. It could be as simple as you are approaching a lease break or renewal and want to explore your options, to determine what costs are like elsewhere and whether you would be better off moving in the long term. If this is the case, it becomes a matter of deciding whether your organisation can comfortably work from your current workplace for the duration of any new, extended lease or if a new space is the better option. Another factor could be growth and you simply need to find a larger space to accommodate more staff. Your organisation is performing well and headcount is expanding at a rate that your current space can no longer keep pace with and so, a new, larger space becomes the only logical solution. It may also be that your office has become dated, a little dilapidated and has not seen any investment in some time and is not somewhere that staff are proud of or enjoy working. Essentially it is not an office that truly reflects your brand and corporate identity. The office has become a reflection of your brand and has a major role to play when it comes to attracting and retaining the very best staff in what is a competitive market. So, providing existing and potential staff with a workplace that really works and where they enjoy being has become increasingly important. Think about whether your current space can deliver or if a new space will allow you to create a vibrant, fresh new workplace. Others factors like workplace wellbeing and/or embracing a new, more productive way of working may also influence the decision to move office. Your existing space or layout may not be equipped to handle hot desking, agile working practices or new technology and needs to be adapted so your organisation can avail of the numerous benefits like increased productivity, staff morale, efficiency and so on. It is so important that you define the reasons at an early stage as all organisations differ and have unique requirements. 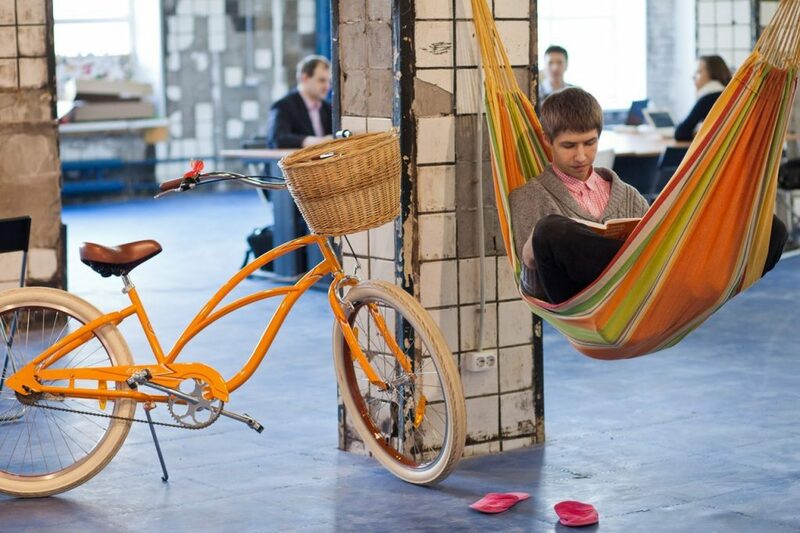 So, you’ve spent time defining the reasons why you need to move office, what next? Once you’ve defined your list of reasons for moving office, it’s time to put together a cross-departmental team and most critically to get a senior project champion on board. This should be somebody senior who can make decisions, who can communicate well, has experience managing budgets and importantly, someone who wants to create a better workplace. 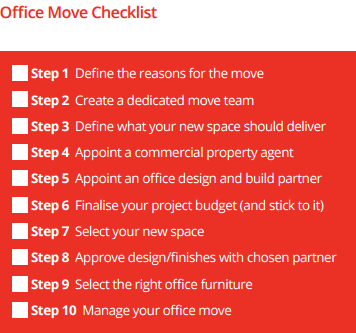 After selecting your office move project champion, you need to decide who else needs to be involved and also what skills are required, the list below includes examples of the skillset required to deliver a successful office move project. IT: Technology in the workplace is evolving at an ever increasing pace so involving IT is a smart move to ensure you future proof the new workplace from an IT perspective. HR: Staff may have concerns about the new workplace so proactively involving the HR team so you can communicate effectively with staff is important. Facilities: Nobody will need to know the building better than the facilities team so it really is a no brainer to get them involved at an early stage. Marketing: Creating a workplace that reflects your brand and its values is crucial so involving marketing is important so you get the branding element right. Operations: The day to day functioning of the business needs to continue uninterrupted during the move so involving the operations team is a must. PA’s: Often overlooked but a hugely influential group who can help to deliver a seamless transition from the old office to your brand new office. Finance: It goes without saying that having somebody senior from the finance team involved is crucial. Somebody who can effectively manage the budget and who can take care of the associated admin (raising PO’s, ensuring invoices are paid etc…) is so, so important. So, you’ve defined your reasons for the office move, assembled your A team, now it’s time to discuss what kind of workplace you want to create and what kind of space you need to do it. 3. What space works for our company? Now is the time to get together as a team and discuss what you like and dislike about your current workplace, and to develop a brief detailing what you want to achieve. 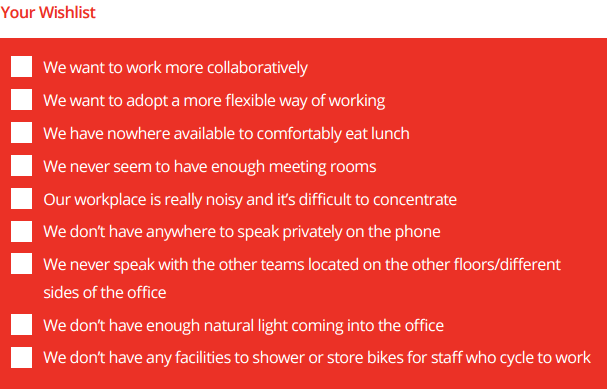 Lock yourselves away in a room somewhere (doesn’t have to be at the office) and make a wish list for your new workplace. 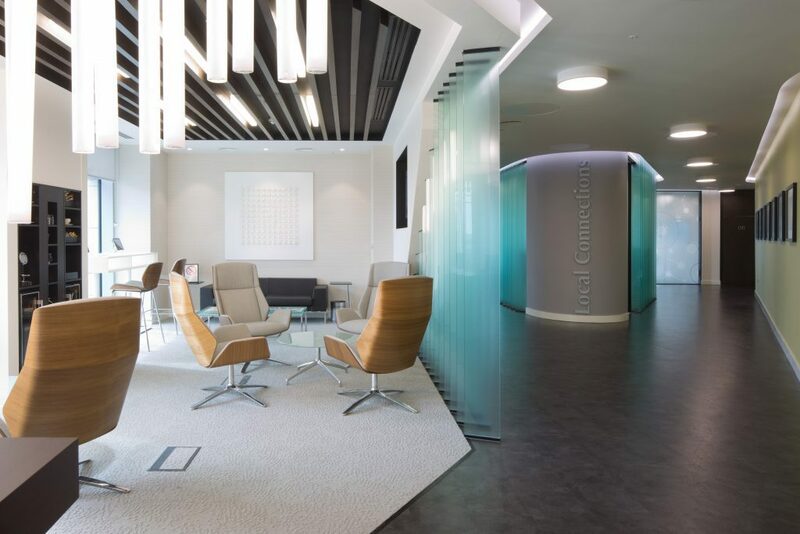 This can include pretty much everything from embracing new technology, adopting a new, more flexible way of working, increasing collaboration and creativity to what type of reception area you’d like. It’s also important to look at ways of solving issues that exist in the current office. There may be a lack of regular communication between different teams, a lack of meeting room availability, staff not feeling confident to work away from their desk and/or nowhere to take a private or work related call. All of these issues are important to pinpoint and to include in the brief for when you start speaking with both commercial property agents and office design and build companies. This initial wish list will morph into your brief when looking for a new space, so make sure you include everything, otherwise there’s a possibility that the same issues may reappear in your new office. All of these factors will influence the type of space you are looking for and also the final office design so take the time to discuss them in detail, it will be worth it in the end. It is also worth adding that this doesn’t necessarily need to involve just the team members, hosting a company meeting to get staff views can also be invaluable. So, your newly assembled team have discussed not only why you need to move office but also what your new workplace should deliver for you. This has formed the basis of your brief, so what next? There are numerous commercial property agents out there so spend some time researching potential candidates and ask for recommendations before creating a shortlist and getting in contact. The agent will ask where you would like your new office to be located, when you need to move in and how much space you will need before selecting several potential spaces that you can view. Feel free to engage with a few credible agents who you feel confident can find you the perfect space. Remember to always refer to your list of requirements and to spend some time weighing up each option before coming to a final shortlist of spaces. It is also worth noting that it can be a competitive market in some locales so ensuring that you move quickly when the right space presents itself is critical. While you are looking for a new space with your chosen commercial property agent(s), it is also recommended that you start to research and approach office design and build companies that you can potentially work with. The sooner you pick a partner to design and build your new workplace, the sooner you can start planning your office move. The more time you have to engage with your chosen partner, the greater chance of success as you’ll have spent more time developing your brief and defining exactly what will work for your organisation. Getting potential office design and build partners involved while you are selecting a space is also advisable as they can provide test fits, conduct feasibility studies and make recommendations that can prove invaluable and help you to select the best possible space. So where to start? How do we select an partner to design and build our new office. We recommend conducting some online research and also asking friends, colleagues and peers and even neighbouring companies for recommendations. Spend some time taking a look through each company’s website and case studies, looking at who they have worked with, before making contact.After making contact, the company should try to arrange a time to come and meet with you, to discuss your objectives and to answer any questions you might have. Have you worked with companies in our sector? Do you offer a space planning/test fit service prior to appointment? How financially stable are they? Can we visit some offices you have recently designed and built? Can they assist with any issues that arise with the landlord and local authorities before work can commence e.g. Licence to Alter? How do you ensure you deliver projects on time? Do you have extensive knowledge of office furniture? It is advisable to select a shortlist of 2-3 companies from those you have met, picking those you feel are in the best position with the most experience to deliver your project seamlessly. Get these selected companies to present a detailed presentation to you and your team detailing their design vision, their proposed timeframe for delivery, budgets (more on this later), and also the team who would be delivering the project and their experience. Tip: It is recommended that you visit offices that your shortlisted partners have recently designed and built and also sites that they are currently working on, this way, you can see first-hand the quality of work they deliver, get testimonials from clients and also see how they work onsite. An office move will be a major investment for your organisation, so it is important to ensure you budget in the right way and explore all of the options available to you. 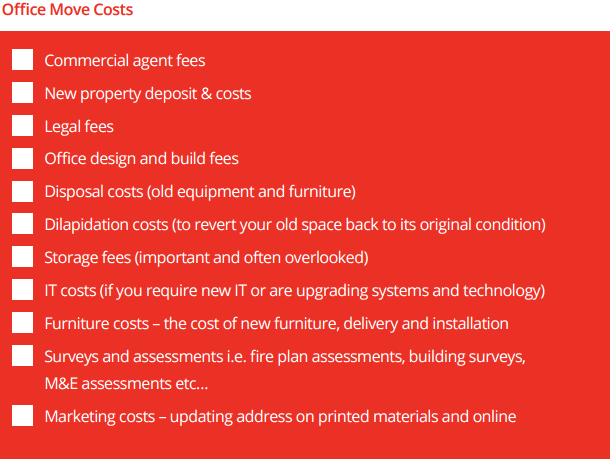 We normally communicate to prospective clients that costs vary from £35 per Sq. Ft. for a basic office design and fit out project right up to over £100 per Sq. Ft. where no expense has been spared. Ensure that your chosen partner can work to your budget and that they can provide a detailed line by line cost breakout for everything from painting and decor to storage and furniture costs. There are numerous costs associated with moving office, ranging from the large to the small, so it is crucial that you spend time with the finance team and project champion to define and approve the budget accounting for everything, while we always recommend building in a contingency to cover any additional unforeseen costs. So you have selected a space that meets all of your requirements, conducted the necessary surveys and feasibility studies and even had your office design and build partner provide a test fit to ensure everybody and everything will fit, what next? It’s now time to negotiate your new lease with your new landlord ensuring that all costs are line with your budget and are not excessive by market standards. It is worthwhile to have your project champion involved at this stage to ensure a speedy negotiation and resolution. Once you are happy that all the points above have been addressed and you and your team are happy, go ahead and sign on the dotted line. Note: We have created a dedicated ‘Finding the right office space’ checklist, which provides useful guidance and tips when searching for a new office. So now that you have selected a new space and an office design and build partner to work with and agreed on a budget to deliver the project, it’s time to plan the project ensuring your new office is delivered on time and on budget. Your partner can assist with getting the relevant permissions and licence to alter from your landlord and if necessary the local authorities. Once all of the required paperwork is in order, you should start to discuss a detailed plan with timings and key milestones, critical for any office design and build project. It is also important to work with other tenants, your new neighbours to communicate your plans and to ensure that any disruptive, noisy works and bulky deliveries are scheduled outside of working hours. While this programme of activity is being agreed, it is also essential that you and your team engage with the designers to discuss the design style you wish to adopt before finalising and signing off on your new workplace design. This process can involve a series of design meetings, workshops, trips to showrooms to select furniture and other finishes and visits to other offices to determine your likes and dislikes. Your partner can also produce mock ups and 3D renders of how your space will look based on the brief and feedback provided. Now, your new office is really coming to life. The design has been finalised, you project plan has been agreed and everybody is gearing up to move onsite to deliver the project, don’t forget to spend some time selecting the right furniture for your new workplace. Your office furniture selection is important as it should reflect your brand and will be the most visible element of your new workplace. Spending time appraising and selecting seating, desking, collaboration furniture and meeting room tables can make a huge difference an help create a workplace that truly reflects and works for your organisation. There is a plethora of options available and lots of quality furniture brands to choose from, so it is advisable to spend some time visiting showrooms with the furniture expert from your office design and build partner and taking on board their advice. Furniture is also playing an increasingly important role when it comes to workplace wellbeing with an increasing number of companies opting for sit-stand desks for staff, tall table designed for quick, efficient standing meetings and booths providing staff with somewhere to concentrate. Take your time and get advice from furniture experts before making your selection and ensure it works within your budget and that each item can be delivered on time. The project is underway, your staff (and you), are getting excited about their new workplace and everything is starting to come together, so how do you manage the office move and transition to the new space. Has the office move date and information being communicated to all staff and customers? The regular site meetings should flag up any issues or challenges allowing you time to adapt but hopefully, everything should run as per your agreed plan. As the project approaches completion, spend some time evaluating your new space highlighting anything you would like changed – this can range from the relatively minor to the more serious. Your objective should be making sure that everything is perfect for when your staff move in and start working. It’s almost time to move and it seems like there are a million and one thing’s to take care of in advance but where should your focus lie? As your office move day approaches, the focus should be on ensuring that everything is ready and working for when staff arrive. We recommend working closely with your design and build partner to identify potential issues and importantly to come up with solutions in a timely manner. All of your furniture should be installed in advance and IT and AV systems tested and working properly, this can include new desktop PC’s, meeting room screens, access cards, WiFi access and speed and more. As already mentioned, communicating with staff is critical and ensuring that everybody knows how to get to the new office, has the required access card (if necessary), and knows where they will be seated is important. Arranging pre- move in visits to site in advance, can be hugely beneficial but try to ensure the site is as tidy and accessible as possible – or pretty much as close to completion and handover as possible, so staff get a real feel for the space. On moving in day, host a team breakfast and have your project champion address everybody, speaking about the new workplace and what it is designed to achieve, with some time for Q&A. It is important that staff embrace the new space so make sure they know who to come to with issues or questions and that they know how to use any new features or technology – providing a Q&A sheet for all staff is good way of sharing important information. Tip: Show off your fabulous new space and host a party inviting clients and staff – it’s the beginning of a new era so it is worth marking the occasion. 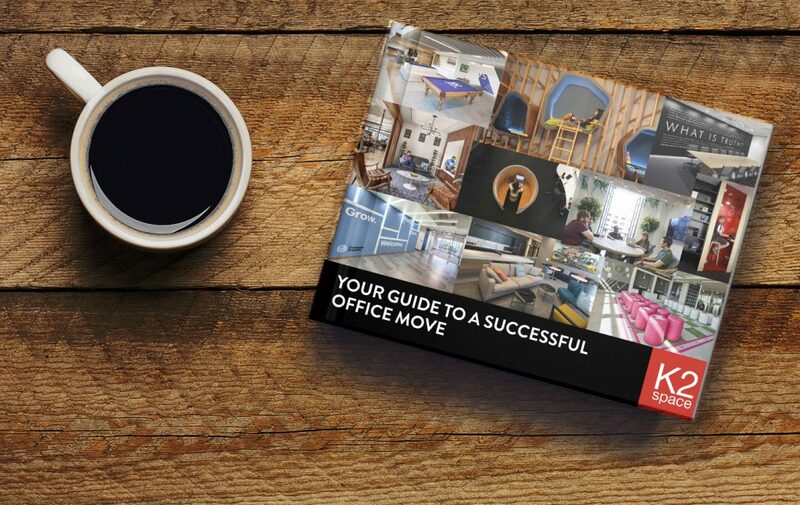 Download our step by step guide to ensure your office move is a successful one.